Star Wars toys have been in the news, as people reacted angrily to the distinct lack of merchandise based on The Force Awakens’ main hero, Rey—culminating in rage over a Rey-less Monopoly set. Hasbro have promised to include Rey in a later set, but why wait? Here’s some Rey merch you can get your hands on right now. Word to the wise if you’ve not seen The Force Awakens just yet—there will be some major spoilers in some of these products. Tread lightly! The problem with Rey merchandise is that some of the most basic versions—like Rey action figures—are actually out there (other sites have been doing great work cataloguing the best). It’s just that a mix of scarcity and an extremely positive reaction to Rey after the release of the film has lead those basic items remaining incredibly scarce. When they do appear, they often vanish quickly... only to appear online for double or triple their retail price. The real challenge is not necessarily a lack of great merchandise featuring the character—as you’ll see below, there’s plenty—it’s finding it at decent prices. One of the first things we ever saw about The Force Awakens was Rey jumping onto her little speeder and jetting off into the desert of Jakku—and the ice-lolly-shaped bike has become an iconic image from the film despite its minor appearance. 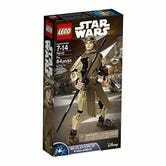 It’s also the cheapest of Lego’s Force Awakens line of sets, so it’s actually easier to get Rey as a minifigure than the likes of Captain Phasma, Finn, or Han Solo. The set includes Rey, one of the thugs that tried to steal BB-8 off her for Unkar Plutt, and of course, her speeder. 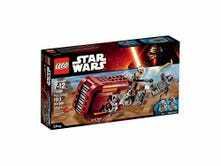 If you want an even bigger set, Rey also appears alongside Finn, Chewbacca, Han and BB-8 in the most expensive Force Awakens Lego set: the Millennium Falcon. This figure can be difficult to find online—Amazon currently has it for a whopping four times the typical retail price of around $8—but it should be more common out and about at toy stores, now that much of the “Force Friday” frenzy has died down. The most basic figure, this nearly 4” tall toy only has five points of articulation, which make disappoint fans of the super-articulated Star Wars toys of a few years ago, but it’s ideal for young kids. 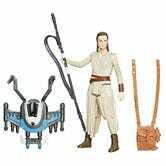 This rey comes with her satchel, quarterstaff, and a large “weapon” toy that can be combined with accessories from other Force Awakens figures into a larger accessory. Another figure that’s difficult to find for its $22 retail price unless you go store hunting, but for different reason—it comes with a 6”-scaled BB-8 to go with it, upping the demand to the point that third-party sellers are trying to flog the toy for nearly $50. If you can get it for the usual $20-ish price it’s meant to be, it’s much better value. Aimed at collectors, this Rey is bigger that the other action figure, and has better detailing, articulation, and paint jobs. Plus, BB-8! He’s pretty adorable. Want something a bit bigger than the Lego version of Rey’s Speeder? There’s also a version made for the 3.75” line of action figures! 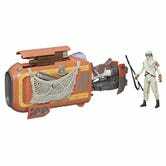 The speeder itself has a pop up projectile launcher as an action feature, and also comes with an exclusive version of the normal Rey figure, her head all wrapped up in her scavenging goggles. Exclusive to the Disney Store both at retail and online, this figure is very similar to the Black Series figure set of Rey and BB-8 in terms of size and articulation. But instead of being made out of plastic, it’s actually a diecast metal toy, giving it a bit of weight. Most interestingly is that there are two versions of the figure floating around. When it was originally released, this toy just came with Rey’s quarterstaff, and the blaster she is given by Han Solo—but on the day the movie came out, Disney replaced it with a version that also came with a blue lightsaber, to reflect Rey’s journey on the path of the Jedi by the end of the film. If you go to a retail Disney Store you still might see some lightsaber-less versions floating around, but if you’re shopping online, only the newer one is available. If you’re looking for more prop toys rather than figures and playsets, both of Rey’s main weapons are readily available. To go with their Rey costumes, Rubies sell a plastic version of Rey’s quarterstaff—it’s intended for children rather than adults, and comes in at around 3.5 to 4 feet, and can be broken down into three parts when not in use. But the Disney Store has an exclusive light-up version of Rey’s lightsaber, if you’d rather swing that around pretending to fight Kylo Ren. Roughly 33” in length, the blue-bladed lightsaber lights up when you press a button on the hilt, and has motion-triggered sounds and vibration for when you swing it or clash it against another lightsaber. Want something a little more action figure-y, but that you can build like it’s Lego? Well, enter the Star Wars “Constraction” figures, a line of Lego toys that uses the company’s technic building pieces to construct a poseable 9” figure. The unmasked humans in the line look a bit weird, but Rey probably comes off the best due to her head being partially covered up by her scavenger mask. The figure also includes her staff and blaster pistol, too. Funko’s Pop! Vinyl toys are everywhere, and almost every pop culture franchise under the sun has been recreated in the line’s trademark big-headed design. 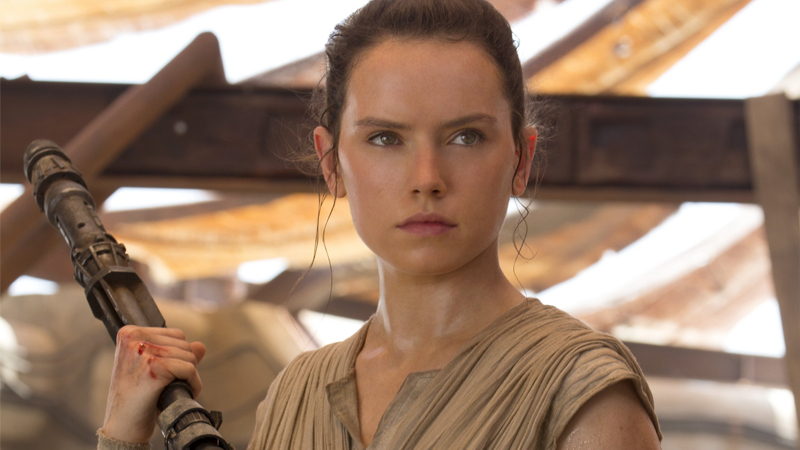 Star Wars is no exception, and neither is Rey, who has not one, but two figures in the series. Well, I say figures, but the Star Wars Pop! Vinyls differ from the usual sort in that they are roughly 4-inch-tall bobbleheads rather than traditional toys. These little things aren’t for everyone, but if you’ve already got a few sitting on your desk, Rey is a worthy addition. The standard version of her is readily available anywhere that sells Pop! Vinyls, but Undeground Toys has an exclusive variant of her in her scavenger goggles that you can hunt down, too. Disney’s “toys to life” video game Disney Infinity was all Star Wars themed last year, bringing a host of statuettes and video game levels from a galaxy far far away to the kid-friendly action/platforming series. This new level lets you actually play as Rey or Finn! If you’ve not already bought the game’s starter set—which can cost around $60 and comes with the game, two Clone Wars toys and the peripheral that scans them into the game—this is a steep investment. 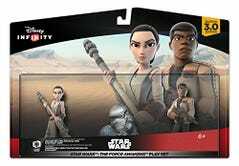 To get the most out of the Force Awakens set, which includes figures of Rey and Finn, and a new level for the game based on the events of the movie, you’ll need it. But if you and your family are already invested, this 2-3 hour adventure can be pretty fun. Plus, Daisy Ridley and John Boyega reprise their roles as Rey and Finn! Retail price: $35, requires Disney Infinity 3.0 Starter Set to access game level. Okay, so you can’t actually get this one right now, and it’s strictly for adult collectors with hefty piles of spare income, but it’s too cool not to include. Available for preorder now from Sideshow Collectibles, this jawdropping 12” figure of Rey and BB-8 is made by the Hong-Kong-based figure makers Hot Toys, who are very well known for their incredibly detailed figures. As well as a BB-8 to match, this Rey comes with her staff, a blaster pistol, realistic material clothing, an alternate head covered by her mask and goggles, and a variety of alternate hands to pose her with. She won’t be out until around June, but if you’ve got the cash, she’s a very tempting choice.